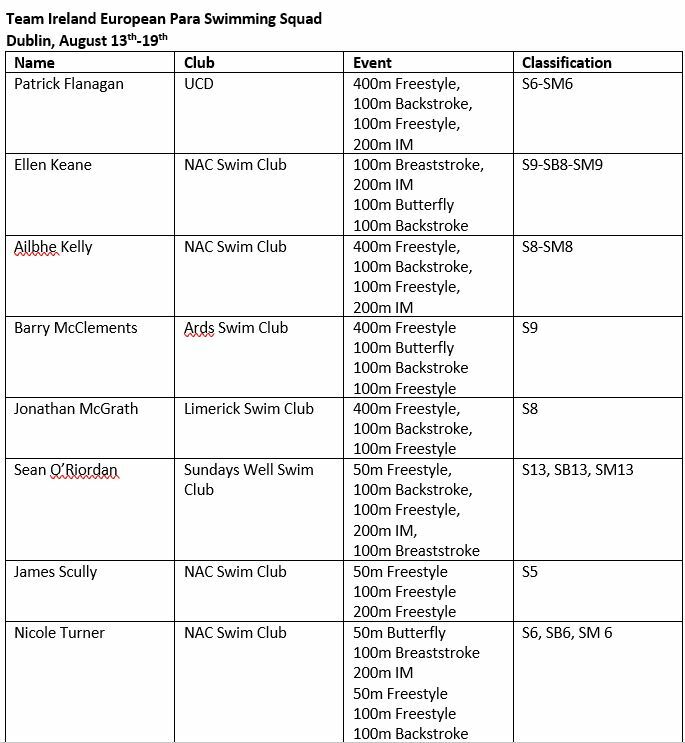 Longford's Patrick Flanagan will represent Team Ireland at the European Para Swimming Championships which take place at the Sport Ireland National Aquatic Centre from August 13 -19. Paralympics Ireland announced the swimming selection at a function in Swords Castle recently and the World Para Swimming Allianz European Championships next month will be the first time ever for Ireland to host a major International Para sporting event. Patrick is named in an 8 person squad for Dublin 2018 and it also includes Rio Paralympics Bronze medal winner, Ellen Keane, Ailbhe Kelly, Barry McClements, Jonathan McGrath, Sean O’Riordan, James Scully and Nicole Turner. 20 year old Patrick Flanagan has been making a name for himself as a para swimmer since he was selected as the Swim Ireland Disability Swimmer of the year in 2012 at just 14 years of age. Since then Patrick has begun to deliver on that early potential he displayed as he recorded several medal winning performances at the 2015 European Para Youth Games. Team Ireland’s swim team have since departed for a training camp in Portugal as they fine tune their preparations for Dublin 2018. Paralympics Ireland President, John Fulham said, "The European Para Swimming Championship is an important event for our swimmers as they all look to Tokyo 2020 which is coming around very quickly." He added, "Hosting the World Para Swimming Allianz European Championships in Dublin is a great boost to para sports in Ireland. This is an opportunity to put para sports on a pedestal and to give young, budding Paralympians the opportunity to come and see their role models compete in person. I believe our squad of swimmers are a great combination of experience and potential that will give our country something to be really proud of this Summer."